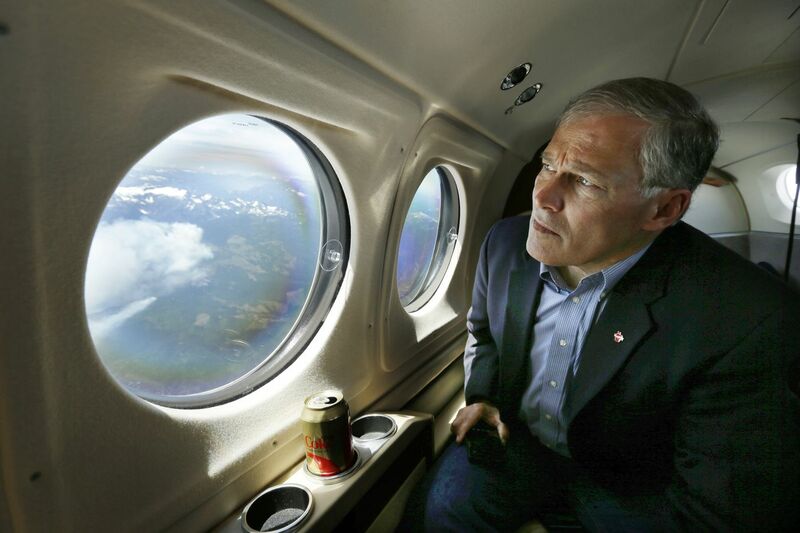 In this July 18, 2014 file photo, Washington Gov. Jay Inslee views the Chiwaukum Creek Fire near Leavenworth, Wash., from the air. Inslee is adding his name to the growing 2020 Democratic presidential field. The 68-year-old is announcing his bid Friday, March 1, 2019, in Seattle after recent travels to two of the four early-nominating states. Washington Gov. Jay Inslee on Friday became the latest Democrat to launch a 2020 presidential bid, asserting in a video that he is the only candidate who will make combating climate change the nation's top priority. "We're the first generation to feel the sting of climate change, and we're the last who can do something about it," Inslee says in the video. "We went to the moon, and created technologies that have changed the world. Our country's next mission must be to rise up to the most urgent challenge of our time - defeating climate change." Inslee, 68, is the first governor to enter the Democratic contest and has the longest political resume of anyone in the race. In 1992, after two terms as a state legislator, he was elected to represent a largely rural, Republican-leaning congressional district in central Washington. In Congress, Inslee attracted national attention by voting for the 1994 assault weapons ban, immediately making him a target for the GOP. "People are fed up with crime and want something done to protect them and their children from violence," Inslee told reporters at the time, standing by his vote. Inslee lost in that year's Republican wave, but he mounted a comeback in a neighboring district four years later. One of the most potent attack ads run against him had portrayed a fictional call from Bill Clinton, thanking Inslee for being so loyal; in 1998, Inslee ran his own version of that ad, with a Newt Gingrich impersonator thanking the Republican incumbent for helping him impeach the president. Back in Congress, Inslee was a reliable liberal vote and a member of the center-left New Democrats. He focused most on climate and environmental issues; in 2007 he published "Apollo's Fire: Igniting America's Clean Energy Economy," a book about ways to transition the country from dependence on fossil fuels to renewable energy. He also kept one eye on Washington, running for governor in 2012 and winning a narrow victory over a popular Republican attorney general. Inslee spent his first term presiding over a divided state government, cutting budget deals with a Republican state Senate and instating a moratorium on the state's death penalty. Inslee was comfortably reelected in 2016 and joined the loud resistance to President Donald Trump, bringing the state into lawsuits to stop a ban on refugees and immigrants from some Muslim-majority countries. But Inslee's time in Olympia entered a new phase in 2018, after a special Senate race gave Democrats full control of the state government. "It will be a bell in the night, showing hope for the country," Inslee told the New York Times on the eve of that election. The governor made good on that bravado, reviving a number of ambitious bills that Republicans had blocked and capping it all with a carbon tax. "I have the unique ability to show the proof in the pudding that we've actually done this," Inslee told the Atlantic. Inslee will have to overcome a few major hurdles as he begins his run. Despite spending more than two decades in elected office in Washington state, he lacks the national name recognition of several of his would-be opponents. And despite his calls for drastic action to combat climate change, Inslee's most ambitious climate change initiative - the institution of a tax on carbon emissions - was voted down in the state's elections last November, thanks in part to massive opposition spending from oil companies. In response, Inslee introduced a new batch of legislation, which he calls "a clean energy smart deal," that he believes would stop the state's utilities from relying on fossil fuel power by 2045. Inslee would also have to overcome some tension within his own party in one of the earliest voting states. Inslee was chairman of the Democratic Governors Association in 2018, and New Hampshire Democrats felt he did not direct enough support to their candidate, Molly Kelly, who lost to incumbent Republican Chris Sununu. In an interview with a local radio station, New Hampshire Democratic Party Chairman Raymond Buckley said Inslee "abandoned" New Hampshire in the 2018 election.